Malclom and I were hankering for donuts again so we agreed to meet up last Tuesday (5th Feb) for some good ol’ donut binge. Reached Pavilion at 8.30 pm and joined the long queue of donuts zombies. We were contemplating on whether to get 1 or 2 dozen of donuts. We got TWO DOZEN. I went prepared for the donut battle having skipped lunch and dinner. I was famished so 1 dozen was not much of a problem for me. Obviously, we skipped the drinks after the previous boo-hoo we had. Since it was a full house, two lovely ladies, Cheryl and Shern offered to let us join their table. Well…an hour later, I did feel very, very jelak. We were way too high on sugar and decided we needed something sour to fix things. So there we were two sugar-high whackos wandering around KL looking for an asam laksa stall at 11.30 at night. 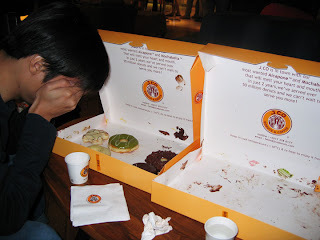 Verdict: Not as good as Krispy Kreme but better than other donut places in Malaysia.